Super nourishing sweet dessert, perfect to enjoy at anytime of the day! (1) Soak dried snow fungus in water for at least 30 minutes, before trimming and cutting into smaller pieces. Squeeze dry and set aside. (2) Bring a pot of water to a boil over medium fire. Add snow fungus, dried longan meat and red dates, bring to another boil. Reduce fire when it turns rolling boil, simmer for about 30 minutes, with lid on. Add black sugar, lid on and simmer for another 15 minutes. 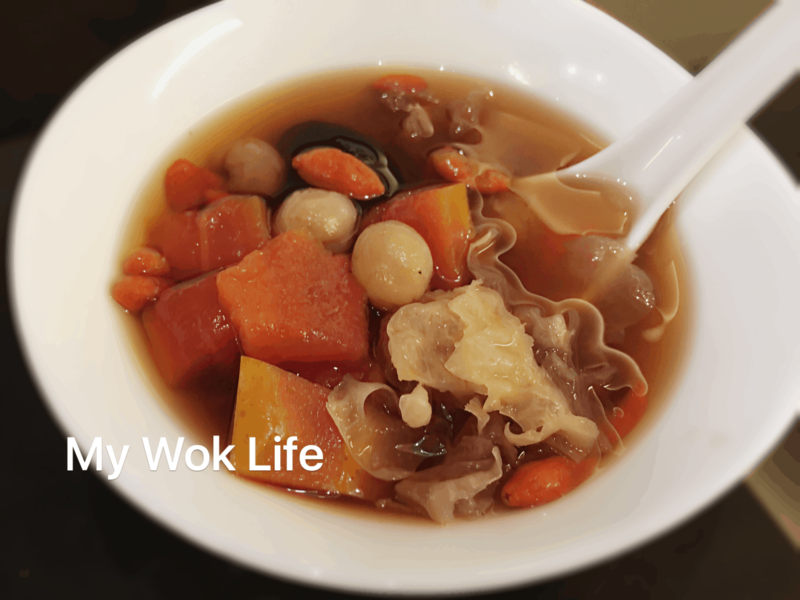 (3) Taste the soup to check sweetness. Add more sugar, if desired. Add papaya, lid on and simmer for 5 minutes before heat off. Remove lid to add wolfberries. Cover pot again to let the remaining heat stand for 5-10 minutes. Serve warm or chilled. 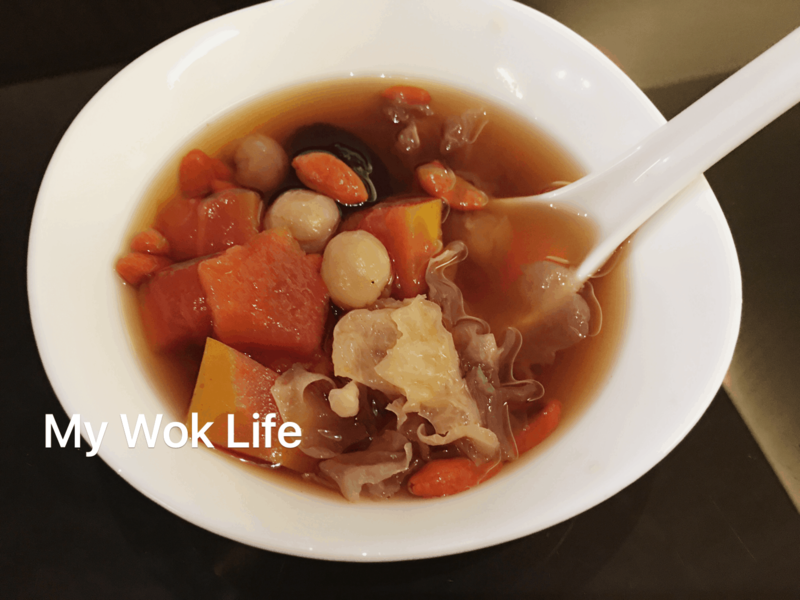 A bowl of my papaya snow fungus black sugar sweet soup counts about 90kcal. Tips: Black sugar will turn your soup into very dark in colour. It didn’t show in my photo as the Okinawa black sugar I used wasn’t as black as those gotten in Singapore. Hence, my soup wasn’t as dark as it will be, if using only the usual black sugar. If total dark soup doesn’t look as appealing, I suggest using rock sugar, or a mix, instead. * Please note that my soup is less sweet version. For real sweet flavour, adjust sugar level to your liking. * Red dates, dried longan meat and wolfberries have to be rinsed before use. If desired, you may even soak the red dates and dried longan meat for a short while. Don’t soak wolfberries though. Simple rinse before adding into soup. * Also be reminded not to add wolfberries too soon as it will turn sourish if boiled for too long, and thus, affect the taste of the soup by bit. * To see the photos of the black sugars used in my soup, check out the comment posting in my FaceBook Fan Page.